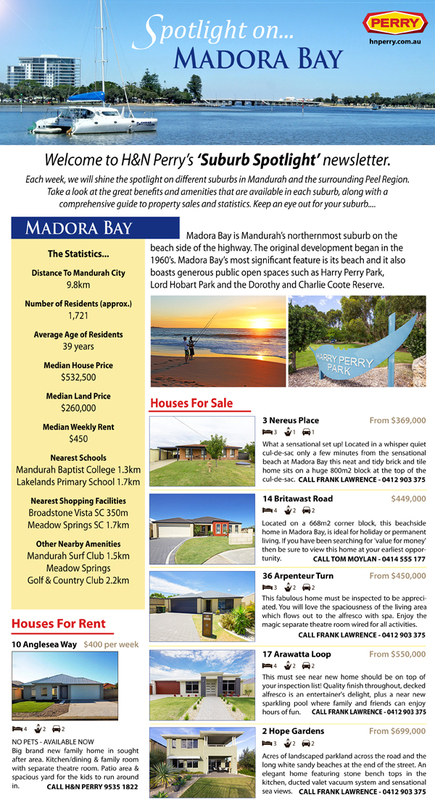 Madora Bay A Top Performer! ≈ Comments Off on Madora Bay A Top Performer! The Real Estate Institute of WA (REIWA) has released its latest research revealing Perth’s 10 Highest Growth Suburbs in 2018. 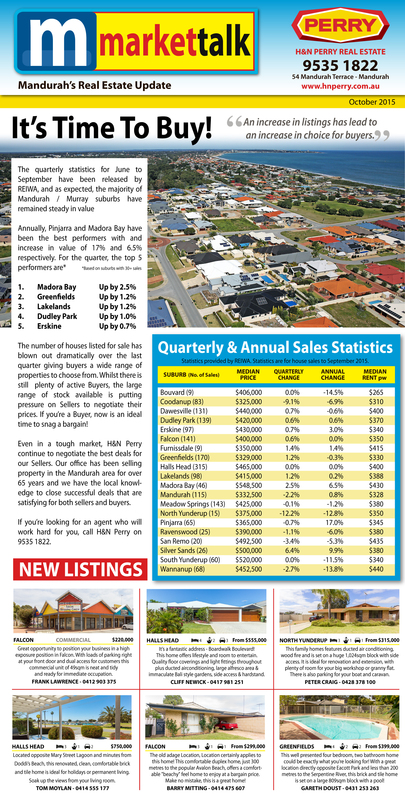 Madora Bay defied the trend to record significant median price growth. The Mandurah beach side suburb took out 2nd place with a growth of 28.7% bringing the median house price value to $560,000. Best Value Ocean Views In Mandurah! Get ready for the best value land sale of the century! 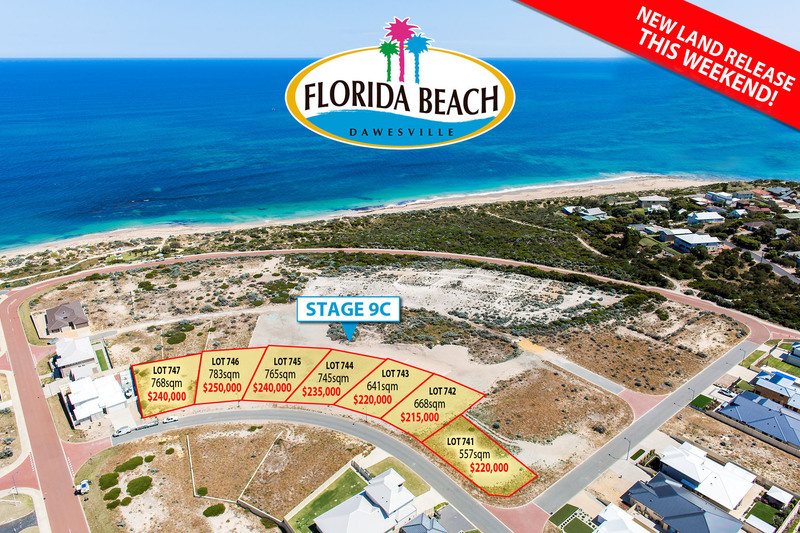 This Saturday 14th November, Florida Beach are releasing 7 exclusive blocks for sale. Stage 9C is elevated at the highest point on Wittenoom Turn and and some lots have the potential for blue water views over Florida Beach and down the coastline. The blocks are all large, family sized homesites up to 783sqm. There’s plenty of room for your dream home plus a pool, spa, shed or all three. The best part though, is the price. There is no doubt that these homesites have been priced to sell. Ranging from $215,000 to $250,000 with a free fencing and landscaping package* – these would have to be the best value ocean blocks around! Florida Beach is an ideal location to raise a family, build your first home or retire. It is one of Mandurah’s quietest suburbs, offering a peaceful beachside lifestyle at an affordable price. There are two quality primary schools in the suburb, one private and one public. The addition of a Caltex Starmart has proven popular, and plans have been submitted for a Coles Shopping Centre to go up along side it. There are also plenty of local clubs nearby including ‘The Cut’ Golf Club, Port Bouvard Surf Life Saving Club and the Port Bouvard Sporting & Recreation Club. Now you can afford to ‘Live the Good Life’ in Florida Beach. The sale starts at 10am sharp this Saturday 14th November at the Florida Beach Sales Office, which is located on the corner of Balladonia Parade and Meekatharra Place. These blocks will be sold on a first in / best dressed basis, and at this price they aren’t expected to last. If you want to secure your first choice homesite, call Bryan Cusick on 9582 3888 to register your interest and then be there on Saturday morning to beat the crowds. *Based on suburbs with 30+ sales. The number of houses listed for sale has blown out dramatically over the last quarter giving buyers a wide range of properties to choose from. Whilst there is still plenty of active Buyers, the large range of stock available is putting pressure on Sellers to negotiate their prices. If you’re a Buyer, now is an ideal time to snag a bargain! Even in a tough market, H&N Perry continue to negotiate the best deals for our Sellers. Our office has been selling property in the Mandurah area for over 65 years and we have the local knowledge to close successful deals that are satisfying for both sellers and buyers. If you’re looking for an agent who will work hard for you, call H&N Perry on 9535 1822. This week the Suburb Spotlight is shining on San Remo. It’s quite an exclusive address given its small size and quality location. Take a look at the amenities on offer and houses for sale in San Remo. 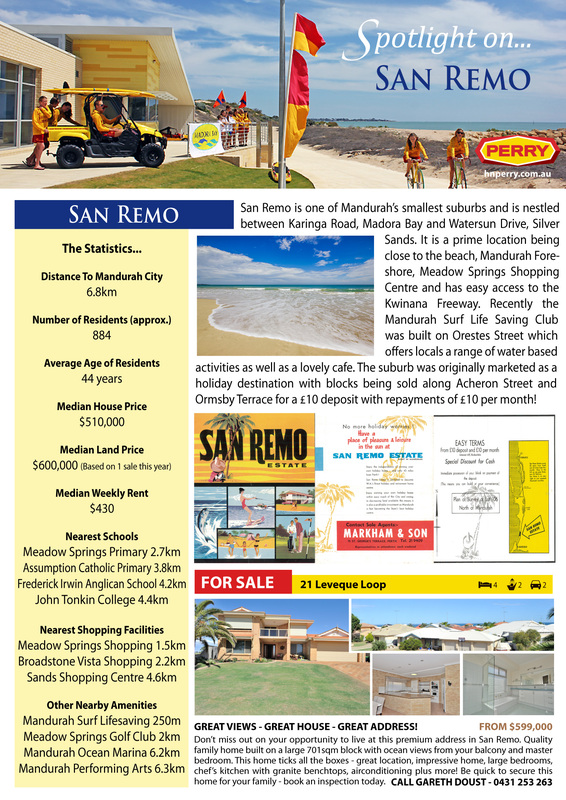 San Remo is one of Mandurah’s smallest suburbs and is nestled between Karinga Road, Madora Bay and Watersun Drive, Silver Sands. It is a prime location being close to the beach, Mandurah Foreshore, Meadow Springs Shopping Centre and has easy access to the Kwinana Freeway. Recently the Mandurah Surf Life Saving Club was built on Orestes Street which offers locals a range of water based activities as well as a lovely cafe. The suburb was originally marketed as a holiday destination with blocks being sold along Acheron Street and Ormsby Terrace for a £10 deposit with repayments of £10 per month! 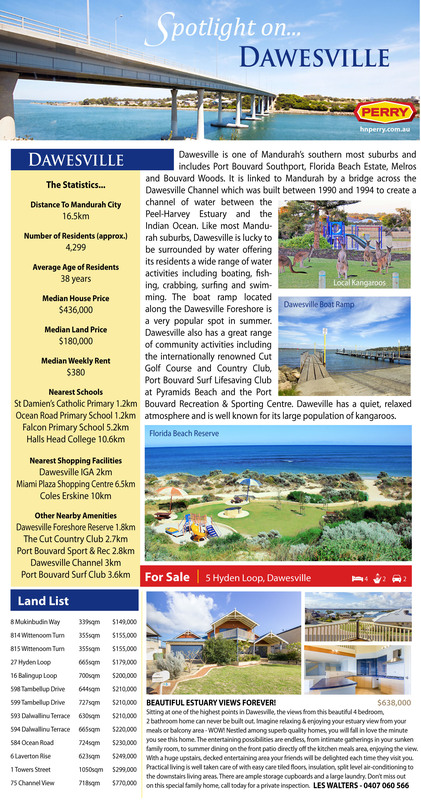 Dawesville is one of Mandurah’s southern most suburbs and includes Port Bouvard Southport, Florida Beach Estate, Melros and Bouvard Woods. It is linked to Mandurah by a bridge across the Dawesville Channel which was built between 1990 and 1994 to create a channel of water between the Peel-Harvey Estuary and the Indian Ocean. Like most Mandurah suburbs, Dawesville is lucky to be surrounded by water offering its residents a wide range of water activities including boating, fishing, crabbing, surfing and swimming. The boat ramp located along the Dawesville Foreshore is a very popular spot in summer. Dawesville also has a great range of community activities including the internationally renowned Cut Golf Course and Country Club, Port Bouvard Surf Lifesaving Club at Pyramids Beach and the Port Bouvard Recreation & Sporting Centre. Daweville has a quiet, relaxed atmosphere and is well known for its large population of kangaroos. Welcome All Class Group Fitness! H&N Perry would like to extend a warm welcome to our new tenants, All Class Group Fitness. Located at 56 Reserve Drive Mandurah, All Class Group Fitness recently opened their doors to an eagerly awaiting public. They are offering the residents of Mandurah fun group fitness classes with first class equipment and highly trained professional staff. They even have an on-site creche, as well as kids fitness classes during the school holidays to cater to the mums and dads. Their new premises is a large 660sqm showroom with ample on-site parking and airconditioning to keep the air temperature comfortable whilst patrons work out. Located in the hub of Mandurah’s busy industrial area on Reserve Drive, the gym is convenient to Mandurah residents from a broad range of surrounding suburbs. Being located near high profile retailers such as Bunnings, Harvey Norman and many other retailers provides a steady flow of drive by traffic which acts as a continuous form of advertising for the new gym. All Class Group Fitness has become instantly popular with the Mandurah community and H&N Perry would like to wish them every success in their future business. Our experienced commercial property management team were responsible for closing the lease agreement and managing the premises occupied by All Class Group Fitness. If you want your investment property to be managed by a team of professionals or are looking for somewhere to base your new business venture, call H&N Perry on 9535 1822 and let us help you.